Color displays may one day be used practically everywhere. And this would be possible even where it’s unprofitable today for cost reasons, such as on food cartons, medicine packaging or admission tickets. 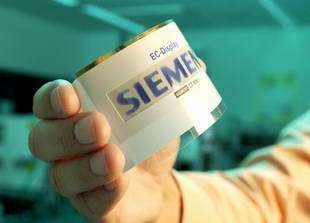 At the Plastics Electronics trade fair in Frankfurt, Siemens developers exhibited extremely thin, miniature color displays that can be printed onto paper or foil. And the displays can be produced at very low cost compared to LCD panels. The first displays will become available on the market in 2007. The displays show information about products, or even operating instructions for devices, directly on the packaging. A pillbox, for example, could display instructions for how it should be taken and provide this information in several languages with the push of a button. Admission tickets for trade shows could indicate the booths where various exhibitors are located. It’s also conceivable that small computer games will be on packages or that equipment boxes will display animations that give users step-by-step operating instructions when a button is pushed. The flexible miniature displays operate using electrochromic substances, materials that change their color when an electrical voltage shifts charges in their molecules. As a result, the molecules absorb different wavelengths than in their original state. The display consists of a electrochromic material holding a pattern of electrodes. A conductive plastic foil serves as the other electrode and the transparent window. To date, the engineers have been using silicon switching elements to control the device. The objective now is to use a printing process to manufacture the entire display, including the appropriate control electronics, from conductive and semiconducting plastics. Scientists from Siemens Corporate Technology and Automation and Drives are currently optimizing materials that react so quickly that the displays can also show moving pictures. A partner company is already working on integrating the displays into the packaging and production process. The displays can obtain their energy from printable batteries, which are already available. Because they last only a few months, this solution is only feasible for merchandise with high throughput rates or short-use durations. It may also prove feasible to use printed antennas as a local energy source. They would receive pulses from a transmitter in the shelf and convert the pulses into electricity. The packaging, with the displays, can be disposed of in an environmentally friendly manner as a composite material.